We need to have a comprehensive Davao Art History. Since I was away from Davao for many years (1960-1961, AFS, Bakersfield, CA. 1961-1967, A d M & Avellana & Assoc., 1968-1993, Bay Area, California), let me recount my experience with Davao artists. 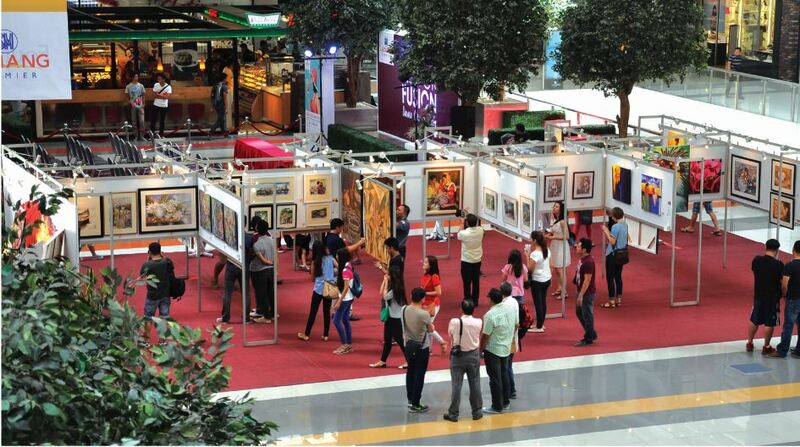 One of the art exhibits at the malls, this one at SM Lanang Premier, during the visit Davao Fun Sale. My earliest memory (CA. Mid-‘50’s) was of the artist who did the original illustration of the Bagobo Holding A Durian – copies of which one still sees in Aldevinco souvenir shops today. His name was Tito Suazo, who was related to the Castillos. Arnel Villegas recalls meeting Tito in his later years. Early Davao artists were: Ang Kiu Kok, who taught at the Chinese HS before he became famous in Manila. In June, in the ‘60s, we had a house guest, Madriñan, who was a very good sculptor who did several busts of Gen. Santos. The famous painter, Victor Edades, spent his retirement years here and taught Art at PWC. He painted a portrait of my mother, Rosa Santos Munda, which now hangs at the Museo Dabawenyo. In the mid ‘60s (1963-1964) Virgilio “Pandy” Aviado, my classmate at A d M, was our house guest in Matina. Pandy and I studied Printmaking at the workshop of Manuel Rodrigues, Sr. in San Andres, Metro Manila. We were winners at the 1964 National Shell Art Competition. After Areneo de Manila, Pandy continued his Art vocation becoming Dean of PWU Fine Arts. Later, he became a scholar of Fernando Zobel and for many years was based in Spain and Paris – where he became Ben Cab’s friend. In the late ‘60’s, I pursued my M.B.A. at Santa Clara university, CA. after which, I worked at Intel in Silicon Valley where I eventually retired from. In the mid-90’s, I returned to Davao, became the GM at Pearl Farm and at Nenita Food Processing. My art career was revived when I set-up a furniture-making shop, Bay Woodcraft. I built furniture and studio easels for several artists like Vic Secuya, Bruce Brown, Lito Pepito, Alan Obeso – in exchange for their artwork. During this time, I met several Davao artists. One of them, Jun Alfon, who was married to my cousin Corinna, introduced me to Atty. Tim Te. Tim, who became one of my best friends, was the founder of D.C. LAW and headed Pacific Oil. Tim was an art patron. Thru Tim, I met other Davao artists like Errol Saldaña, Rey Fuentes, Vic Secuya, Boy Luna, Lito Pepito, Orley Ypon, Bruce Brown. With Tim, we set-up “Probinsiya” in Ma-a the model for MTS – where we also set-up galleries (“Santuaryo”), restos, tree houses and a stage which featured the bands of Popong Landero and Mike Pamintuan every night. During this time, I helped organize the 2-man show of Vic Secuya and Bruce Brown at Gallery 5, JSG Mall where Brenda Barba was the curator. The other galleries in Davao then were: Josie Carriedo’s and Mely Bonifacio’s; Emil Lo’s Gen Luna and the ones in “Probinsiya”. In 2015, the Tabula Rasa Art Group whose members were Bai Manginsay, Daryl Descallar, Brando Cedeño, Dinky Munda and Bong Perez, was formed and launched their first group art exhibit by participating the SM Lanang SM Art Market exhibition. From 2016 to 2018, the Tabula Rasa Art Group (Bai Manginsay, Daryl Descallar, Brando Cedeño and Dinky Munda) organized the Visit Davao Fun Sale Art Exhibits at many of the hotels and malls in Davao City. This greatly helped in the resurgence of art in Davao – so that today we can boast of 2 museums, 5 art galleries and many art exhibits almost every month. Along with that, three art shops have opened to cater to the needs of local artists. Let’s keep up the momentum. There was a Davao Artists Foundation – although I was not a member, some of its members were: George So, Arnel Villegas, Jun Alfon, Errol Saldaña, Bryan Cabrera, Rodney Yap, Jun Cayas. There are more – but I don’t remember the rest. This very brief history of Davao Art and Artists is based on what I remember – although admittedly now a little hazy. I hope other artists can help piece together from their experiences – so we can complete this history. Please email or FB your contributions to me. By Dinky Munda, Jr.